If the RIAAs figures are to be believed, sales of vinyl records in the first half of 2004 were greater than the sales of SACD and DVD-Audio discs. These figures dont count hybrid SACD/CDs as SACDs, but they do indicate that many people continue to enjoy the very first high-resolution format, the LP. The vinyl resurgence of recent years has brought with it a new batch of turntables for those looking for an affordable way to enjoy their records. Thorens is a Swiss company that traces its business back to 1883 and founder Hermann Thorens, who designed music boxes and movements. Thorens began making phonographs in 1903, and continues this fine tradition today. Recently, they introduced the TD 190-1 ($599 USD) to the competitive class of budget-conscious turntable designs. As I documented last year in "How to Decide if a Turntable is Right for You," record players require much more maintenance and care in setup than do digital disc players. This can turn people off to turntables, especially new users who are used to plugnplay digital players. Like some of its competition, Thorens has tried to minimize the maintenance and setup of their affordable models by including a premounted phono cartridge. Users will still want to check that the cartridge is aligned properly, but the difficult task of attaching cartridge to tonearm has already been done. Such thoughtfulness makes these affordable models great for those new to vinyl, or who want a turntable for occasionally listening to records but dont have a vinyl-centered system. The Thorens TD 190-1 comes carefully packed, with an owners manual that will help with the unpacking and assembling of turntable, platter, and dustcover. The tonearm comes already attached and cannot be removed. The TD 190-1 is about 18" wide by 5" high by 14" deep and sits on four footers. It is finished in a standard textured matte black. The clear acrylic dustcover attaches to clips on the tables rear. The cover looks nice, but if its anything like the clear acrylic covers of other tables Ive had, it will be susceptible to scratches and discoloration. If you want it to continue to look nice, youll need to take care. I could swear that all I ever did was put a few CDs or remotes on my dustcover, but when I examined it recently, it looked as if it had been through a war. For best results, use the Thorens dustcover as a dustcover, not a storage space. The TD 190-1 comes with an Ortofon OMB 10 cartridge already installed. The manual contains clear instructions on how to set the cartridge's tracking and antiskating forces. The tonearm is designed to give easy access to both of these adjustments; once you've set it up, it's easy to change the settings if needed. The manual also explains how to go about changing the cartridge to another of your choice; even someone new to turntables will find the directions easy to follow. I suggest you double-check the tracking force with an inexpensive gauge such as the Shure SFG-2. You can do without this step, but the precision it brings is worth it. The supplied power cable attaches to the rear of the TD 190-1, which is where you'll find the RCA outputs and ground-wire connector. The RCA cables are captive -- you won't be able to change cables. The controls are on the 'table's front top and left side, near the tonearm. A knob on the front allows the user to select the platter's speed of rotation: 33rpm, 45rpm, or 78rpm. Not many will use the 78rpm option, but having it here sets the TD 190-1 apart from many other turntables. (If you play 78s, you'll need the OMB 10 cartridge supplied with the optional Stylus 78, which adds $50 to the cost of the turntable). One group of features that sets the Thorens apart from many other tables in this price category is its level of automation. After selecting the platter speed, you can select the records diameter with a switch along the side the tonearm is on. The choices are labeled 17cm and 30cm (for 7" and 12" records); there is no 25cm (10") setting. With the diameter selected, you simply move the Start/Stop switch to Start and everything is taken care of. When the tonearm reaches the end of the side, it rises, returns to its rest, and the player switches itself off. All of this automation can be bypassed by using the tonearm lift to raise the arm, then manually placing it over the record and lowering the arm. Like most things, there are up and down sides to this level of automation. As someone used to an entirely manual table, I appreciated how much simpler automation makes things (especially when the TD 190-1 returned its tonearm to the rest position). But the plastic switches do not inspire my confidence in their longevity, and all of this automation means more moving parts that can break down. I listened to the Thorens TD 190-1 pretty steadily over a couple of weeks and enjoyed it for casual listening. I first tried pairing it with a Pro-Ject Phono Box, but found that the phono section of my old Marantz 2238B receiver sounded better. The rest of my system comprised a HeadRoom Total BitHead headphone amp and Grado SR60 headphones, a Rogue Audio Tempest integrated amplifier, and Quad 21L and Axiom M22ti loudspeakers. The TD 190-1s automatic tonearm return made it much more convenient to throw a record on without having to pay attention to when it would end. Usually I wait to listen to records until I can be sure I wont be distracted, then end up leaving the stylus on the spinning record long after the music ends. With the Thorens, I found myself listening to more records than usual because I didnt have to worry about that. A good thing! When it came time to critically evaluate the Thorenss sound, I pulled out some popular releases with which a wide variety of people are probably familiar. Like all turntables near this price that Ive heard, the TD 190-1 did some things well at the expense of others. In general, it was good at soundstaging and conveying dynamic shifts, and had a sound that was smooth but at the expense of ultimate detail. First up was an RCA Living Stereo release of Earl Wild, Arthur Fiedler, and the Boston Pops performing Gershwin [RCA Victor LSC-2367]. The instruments were nicely spaced and did not crowd each other throughout Rhapsody in Blue. The shifts from soft to loud passages throughout the piece provided the emotional jumps that Im sure Gershwin intended. The sound was a little lean, which I could hear in how instruments didnt sound as if their full weight was behind them. Wilds piano, for example, sounded small; when he struck the keys, I found myself waiting for the instruments full sound to emerge. Overall, some of the individualized characteristics of the instruments seemed to be missing: the woodiness of Pasquale Cardillos clarinet wasnt there, and the piano could have been mistaken for a good electronic keyboard. The sound was much better on Dave Brubecks Time Out [Columbia CS 8192], each quartet member seeming to occupy his own place on stage, but deep bass notes lacked definition and character. The overall presentation again seemed smooth and not analytical. The cymbals sounded real, each stroke of a drumstick producing a distinct tap on the cymbal; this is not always accomplished, and was a big plus in my book. Playing my copy of Johnny Cash at San Quentin [Columbia CS 9827], the TD 190-1s portrayal of the band and the appreciative captive audience was accurate. The lack of deep resonance in Cashs voice might signal a concern for bass freaks, but it didnt detract from my enjoyment of the music. One of the TD 190-1s competitors is the Pro-Ject 1.2 turntable ($319), which also comes complete with a cartridge, a Sumiko Oyster. The Pro-Ject costs less than the Thorens and is, therefore, a much more stripped-down design. First, and perhaps a minor detail to most, the Pro-Ject cannot play 78s. Second and more important, to change the speed of the Pro-Jects platter the user must remove the platter, use a small tool to move the drive belt to a new location, then replace the platter. If you listen only to records of a single speed, this wont matter, but experience tells me that this is a real pain in the neck -- I have a few hundred 7" singles that I rarely play because of this. The ease offered by the Thorenss speed-selection switch is greatly appreciated. The Thorens also did much better than the Pro-Ject 1.2 on the knuckle-rap test. When I rapped on the shelf the turntables were on, both kept playing their records without a problem; but when I rapped on the tables directly, the Pro-Ject skipped much more easily than did the Thorens. I played the same three LPs on the Pro-Ject 1.2 as I had on the Thorens. With the Fiedler, I found that the instruments had more weight behind them, but it was still not near the best vinyl has to offer. The piano was better reproduced, and I found that I got much more wrapped up in the music. On Time Out, the bass was much more authoritative with the Pro-Ject, and easier to identify in the overall mix. Microdynamics also seemed better, as I could hear in the cymbals of "Blue Rondo a la Turk." I heard fewer dramatic changes with the Johnny Cash record. The differences between these two packages had a lot to do with the partnering cartridges. Ive reviewed the two turntables as-shipped so that consumers will know what to expect from the standard packages. This revealed that, while I preferred the overall sound of the Pro-Ject-Oyster combo, I preferred the Thorens for its ease of use. Considering this, I think the Thorenss set of features justifies its higher price. But if I bought a TD 190-1, Id be looking to get a better cartridge right away. Your dealer should be able to suggest better cartridges at many different prices. Venturing into the world of vinyl is not for everyone, but Thorenss TD 190-1 package makes dipping your toes in that pool easy and inexpensive. 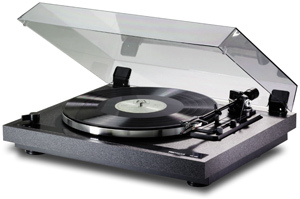 For $599 you get a plugnplay turntable with a substantial base, tonearm, and cartridge. The ability to play 78s is a nice bonus, even if the audience for that feature is small, and the automation features are convenient. Vinyl junkies may want to invest in a more expensive cartridge or even a pricier turntable, but those new to vinyl, and those who want to enjoy LP collections that have been collecting dust in the attic, should check out the TD 190-1. If youre not converting to a vinyl-only system but just want to have the option of playing the occasional LP, then a mostly carefree product such as the Thorens TD 190-1 is the way to go.